According to the Florida Department of State Division of Elections, 1,660,000 Latinos were registered to vote statewide as of book closing on October 9, 2012. 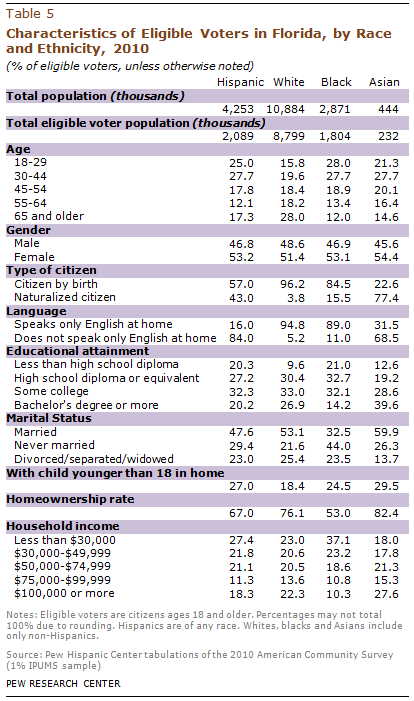 Overall, Latinos make up 13.9% of the state’s more than 11.9 million active registered voters. Among Latino registered voters, 476,000 are registered as Republicans, making up 11.2% of all Republican registered voters. And 645,000 Latino registered voters are registered as Democrats, representing 13.5% of all Democratic registered voters. 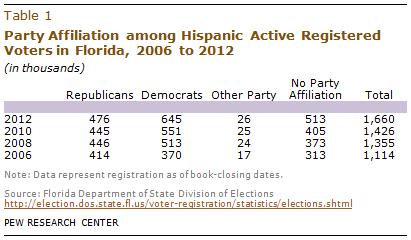 As recently as 2006, more Hispanics in Florida were registered as Republicans (37%) than as Democrats (33%). By 2008, the balance tipped over to the Democrats. This year that trend has accelerated, with the gap between Hispanics who are registered as Democrats (39%) and those registered as Republicans (29%) wider now than in 2008 or 2010. Geographically, the majority of Hispanic Republican registered voters are located in South Florida. According to the Division of Elections, 57% (273,000) are in Miami-Dade County alone. By contrast, among the state’s Hispanic Democratic registered voters, a smaller share, 34% (217,000), are registered to vote in Miami-Dade County. 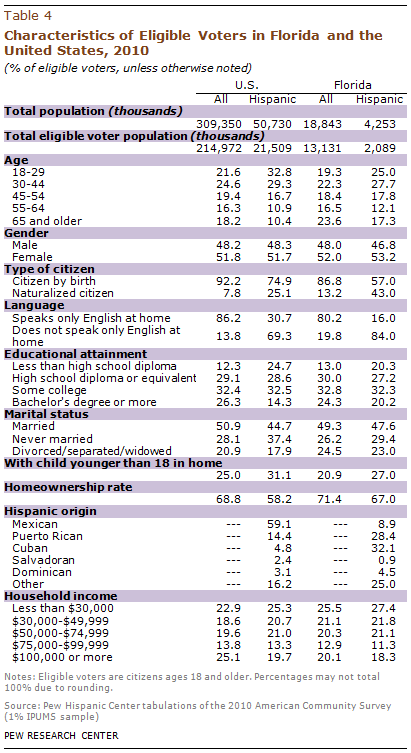 Hispanics have grown from 10.7% of the registered voters in 2006 to 13.9% today. They slightly outnumber black registered voters (13.6%). The share of white eligible voters has declined from 2006, when they composed 72.0% of registered voters. Whites today make up about two-thirds (66.5%) of registered voters, and Asians are an additional 1.6% of the state’s registered voters. The Hispanic population in Florida is the third largest in the nation.4 More than 4.2 million Hispanics reside in Florida, 8.4% of all Hispanics in the United States. Florida’s population is 23% Hispanic, the sixth largest Hispanic population share nationally. There are 2.1 million Hispanic eligible voters in Florida—the third largest Hispanic eligible voter population nationally. California ranks first with 5.9 million. Some 16% of Florida eligible voters are Hispanic, the fifth largest Hispanic eligible voter share nationally. New Mexico ranks first with 39%. Half (49%) of Hispanics in Florida are eligible to vote, ranking Florida ninth nationwide in the share of the Hispanic population that is eligible to vote. By contrast, 81% of the state’s white population is eligible to vote. Age. Florida’s Hispanic eligible voters are younger than all eligible voters in Florida—25% of Hispanic eligible voters are ages 18 to 29 versus 19% of all eligible voters. Citizenship and Nativity. Among Hispanic eligible voters in Florida, 43% are naturalized U.S. citizens. This compares with just 25% of all Hispanic eligible voters in the U.S., 13% of all eligible voters in Florida and 8% of eligible voters in the U.S overall. Hispanic Origin. 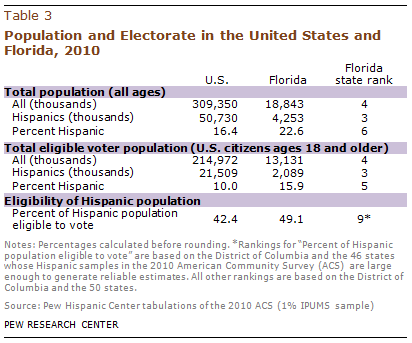 Hispanic eligible voters in Florida have a different Hispanic origin profile from Hispanic eligible voters nationwide. One-third (32%) of Hispanic eligible voters in Florida are of Cuban origin, 28% are of Puerto Rican origin, 9% are of Mexican origin, and 30% claim other Hispanic origin. By contrast, among Hispanic eligible voters nationwide, 59% are Mexican, 14% are Puerto Rican, 5% are Cuban, and 22% are of some other Hispanic origin. Educational Attainment. Two-in-ten Latino eligible voters in Florida (20%) have not completed high school. That is lower than the rate for Latino eligible voters nationwide—25%—but greater than the rate for all U.S. eligible voters (12%) or all eligible voters in Florida (13%). Homeownership. Two-thirds of Hispanic eligible voters in Florida (67%) live in owner-occupied homes compared to 58% of Hispanic eligible voters nationwide. Somewhat greater shares of all eligible voters in Florida (71%) and all eligible voters nationwide (69%) live in owner-occupied homes. Number of Eligible Voters. 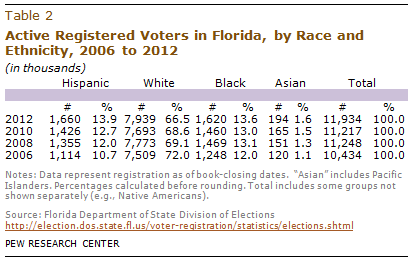 White eligible voters outnumber both Hispanic and black eligible voters in Florida by more than 4 to 1. Age. Black eligible voters are younger than Hispanic or white eligible voters in Florida—28% of black eligible voters are ages 18 to 29, compared with 25% of Hispanic and 16% of white eligible voters. Educational Attainment. More than half (53%) of Hispanic eligible voters have attended at least some college or earned a bachelor’s degree or more, compared with 60% of white and 46% of black eligible voters. Homeownership. Hispanic eligible voters are less likely than white eligible voters in Florida to live in owner-occupied homes—67% versus 76%.